The sacristy of the church of Sant’Agnese in Agone was built between 1658 and 1666 to designs by Francesco Borromini, who planned for the creation of the chapel within the College of Innocent X, the building adjacent to the Church of Sant’Agnese. The plans were for a series of three volumes connecting the college structure with the church itself. 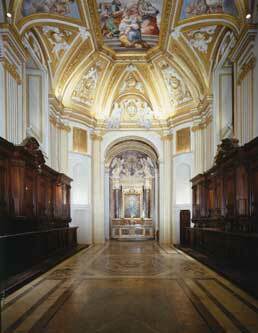 After Borromini was removed from the overall project the sacristy was completed by Andrea Baratta. The main function was for the private religious services of the Pamphili family. The space came to be known as the ‘summer sacristy’ to distinguish it from the previous ‘winter sacristy’. Visitors now enter from Via Dell’Anima, then follow a corridor leading to the north arm of the church. Borromini developed a floor plan replicating the four partitions of ancient palaeo-Christian churches, with an entrance area, nave, main hall and presbytery. The narthex, which has a holy-water niche sculpted by Andrea Baratta, leads to the nave through a grand arch. The hall of the nave takes a rectangular form, with four convex corners topped by small ‘coretto’ chambers, and a vaulted ceiling richly ornamented with paintings and gilded stuccos. The presbytery, dedicated to the Virgin Mary, is a small rectangular space, shallower than originally intended by Borromini, with a barrel-vault ceiling. This space is decorated with frescos by Francesco Allegrini (1660), representing the story of Mary: we see the Madonna on the altar (an image of Mary Immaculate added in the 1700s); the birth of Mary; the Annunciation, on the side walls; the Angels in Adoration in the lunette of the back wall; and finally the Assumption on the ceiling.